The New Arab OTAN – Serving Who? To Zarif, the presence of the former mayor of New York, Rudolph Giuliani, did not go unnoticed, and was protested by the Mojahedin-e Khalqs in the streets of the Polish capital, during the “Conference for the Stabilization of the Middle East”, organised by the United States. Its stated purpose was to create a united front against Iran. American Vice President Mike Pence was present, as were Secretary of State Mike Pompeo, and Jared Kushner, senior advisor for Middle Eastern affairs and son-in-law of the tenant of the White House. Israeli Prime Minister Benjamin Netanyahu came as interim Minister of Defense and Foreign Affairs. At this summit, which assembled more than 50 countries, there were delegations led by Ministers from Saudi Arabia, the United Arab Emirates, Bahrain, Morocco, Oman, Yemen, Jordan, while Egypt and Tunisia sent deputy ministers. Leaving the absentees aside, Tehran can count on the support or neutrality of Algeria, Libya, Sudan, Lebanon, Syria, Iraq, Kuwait, and Qatar, as well as that of Turkey, a non-Arab Sunni power. Coinciding with the Polish summit, Turkish President RecepTayyip Erdogan was in Sochi with his counterparts from Iran and Russia, Hassan Rohani and Vladimir Putin, who gathered there for a new meeting of the Astana trio concerning Syria. On the other hand, after the defeat of Daesh in Syria, the United States and Israel do not accept the influence of the Shia red crescent and Russia, which now extends from the heart of Mesopotamia to the Mediterranean. Could it be that the Warsaw Summit is aimed not only at Iran but also against Putin’s Russia and China? Let’s work in order, and return for a moment to Warsaw. It is no coincidence that the United States chose this location – in the North and at the same time in the East – to talk about the Middle East. Washington has indeed promised Warsaw that it will increase the number of troops from “Fort Trump” to counter the announced danger of a Russian invasion (in reality announced only by NATO’s powerful communication apparatus). There is one condition – the Polish government must cancel the contracts it has already signed with the Chinese company Huawei for the development of the 5G network. Washington knows that whoever wins the communications war wins the world. Thus in Warsaw, while satisfying Bibi’s belligerent impulses, it is strengthening NATO along the border with Russia, which is now surrounded, and protects its now obsolete hegemony of the Celestial Empire that advances, and once again divides Europe. East Asia is now the number one threat to Washington, but the investments that gravitate around the new Silk Road are rife in Brussels, which, in the midst of an economic and institutional crisis, is not willing to interrupt trade with Iran. Significant in Warsaw was the absence of the High Representative for Foreign Policy of the EU, Federica Mogherini, who is currently working on a new financial mechanism that circumvents US sanctions against Tehran. However, Italy, although exempt from US sanctions, has already frozen purchases of Iranian oil (perhaps with persistent hopes in the oil wells of Libya), and immediately responded to the US appeal by sending Minister of Foreign Affairs, Enzo MoaveroMilanesi to Warsaw. Among the European countries, in addition to Italy, only the UK was present, sending Foreign Minister Jeremy Hunt, who brought with him the scent of a “hard Brexit”. Other European countries attended, but with lower-profile delegations. On the other hand, the same Israeli military secret services – notes the Washington Post, which also highlights a further difference of approach within the American establishment – revealed on February 13 that Iran “has not violated the agreement on nuclear power”, confirming what was declared by American intelligence some days before. 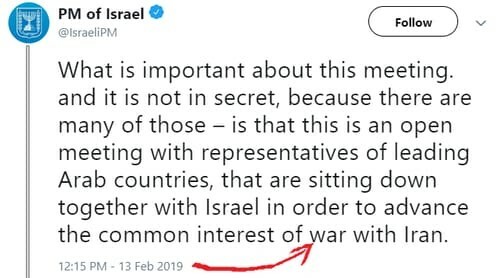 It would therefore seem that this time, the very efficient Israeli intelligence services delayed in providing information to Netanyahu who tweeted on impulse: “What is important in this meeting – and it is not secret, because there are many – is that this is an open meeting with representatives of the main Arab countries, who are sitting together with Israel to advance the common interest: our war on Iran.” But then someone intervened to calm Bibi’s spasmodic frenzy and his tweet, and so with the same speed with which it was published, it disappeared into the dark underworld of the world wide web. In his speech in Warsaw, the Israeli Prime Minister thus limited himself to talking about the need to “fight Iran”, causing, amongst other results, the forthcoming opening of diplomatic relations by several Arab countries, including Yemen, Oman, and Bahrain. Jared Kushner’s Tcefoah plan, on hold for two years, has gone almost unnoticed: the once-divisive Palestinian question has become almost irrelevant. 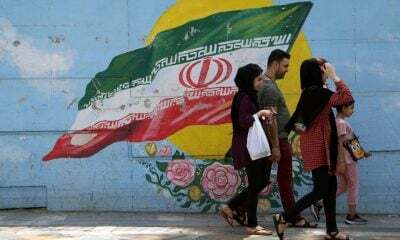 From Warsaw, once known for the military alliance between the former Soviet bloc countries, the first steps of the new Arab NATO against Iran would seem to be moving forward. The plan, known as the Middle East Strategic Alliance (MESA), should focus on the heavyweights of the Gulf, Saudi Arabia and the United Arab Emirates. The creation of a regional anti-missile defense shield, which the United States and the Gulf countries have discussed for years without results, would now be an achievable goal. Israel is responsible for guiding the plan. What can we expect? The worst.